I’m always on the hunt for interesting new workout trends and the Smovey Vibroswing-System caught my eye because not only is it an exercise tool but it also heals the body through our Qi (energy). I’ll let Gernot Faderbauer, Smovey Master Instructor, explain the Qi element in more detail later. What I will say is that I was pleasantly surprised by the workout he put me through. Watching some of the videos online, I felt like it was going to be a walk in the park (both literally and figuratively). You have to understand, the Smovey Vibroswing-System consists of two 1 lb rings that are hollow except for four metal balls that roll around inside, which doesn’t seem like much. But after 10 minutes of lunges, hops and squats, I was a sweaty mess and grinning from ear-to-ear. Those rings are tricky to move in different directions simultaneously and you can’t help but laugh at yourself while trying to be in control. It’s a workout for your brain too! The Smovey can be scaled to any fitness level whether you use it while sitting, standing or jumping. After my workout, Gernot proceeded to show me how the Smovey Vibroswing-System could also be used in a massage while rolling over the muscles and energy lines. I even heard that it can prevent leg cramps in pregnant women! It was definitely a different experience since I’m into deep tissue massages. The light rhythmic movement was so soothing, it lulled me to straight to sleep. Having used the Smovey a few times since, there’s something strangely addictive about the sound of the metal balls moving back and forth and the vibrations in my hands. 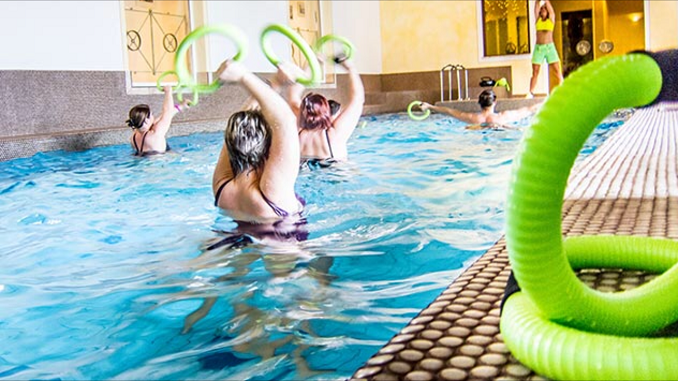 I’m also looking forward to using the Smovey in a pool since they’re waterproof! Now for the interview with Gernot, who, by the way, is also the Founder of the Canadian Nordic Walking Association AND 3 x World Champion and Olympian Rower. For more information visit the Smovey Canada website here. How can Smovey be used both actively and passively on the body? We use the Smovey actively as we hold on to the Smovey handles and swing our arms in many different ways as we are sitting, standing, stepping, walking or jumping. Swinging the Smovey rings moves the balls inside the rings creating a varying resistance of up to 10 lbs. We can work on our balance, coordination, range of motion and strength. The movement of the balls also creates a vibration of about 60Hz, which is transmitted through the handles of the Smovey rings to the palms of our hands. The vibration acts on the meridians in our palms harmonizing the flow of energy throughout the body, providing an exceptional healing effect while working out, leaving us relaxed and revitalized. Gernot giving me a foot massage! Can anybody use the Smovey and what are the benefits? 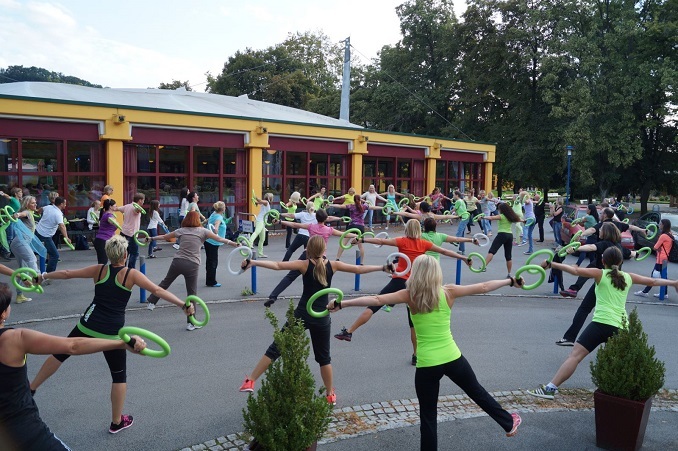 Fitness Enthusiasts – Increases the effectiveness of your fitness program and helps to feel more energized. Rehab patients – Helps the recovery and can provide pain relief. – Burns Fat by activating 97% of our body’s muscles. – Vitalizes over 100 million cells in our body. – Fights cellulite by strengthening and tightening the connecting tissues that cause cellulite. – Detoxifies by massaging and relieving our lymphatic system. – Improves our immune system and the work of our thymus gland. – Strengthens our heart and our cardiovascular system. – Mobilizes our digestive system. – Firms our arms, stomach, legs and buttocks. – Relaxes our muscles by loosening tension in our neck, shoulders and back. – Reduces the symptoms of illnesses such as Parkinson’s, Multiple Sclerosis (MS), Alzheimer’s and Arthritis. – Bones are strengthened to prevent osteoporosis. How long has Smovey been in Canada? Where can we find it? Tell us about the instructor courses and how we can get involved. Our instructor courses prepare participants to present the Smovey training and therapy according to the Smovey Vibroswing-System uniquely proven method. This eight hour course has no previous teaching requirements. You’ll receive quality instructions from an official SMOVEY MASTER INSTRUCTOR and gain knowledge about this new movement’s history, how the development of the product took place, why it was necessary and why it has become so popular for groups of all ages. Course includes: Smovey 4 Steps Intro, Smovey Basic, Smovey Seated, Smovey Walk, Smovey Coordination, Smovey Advanced, Smovey Balance, Smovey Therapy & Deep Relaxation. What do you have planned for Smovey Canada in the future? We are planning to have SMOVEY MASTER INSTRUCTORS certifying SMOVEY COACHES and SMOVEY THERAPISTS who love helping others all over Canada. Every rehab clinic, wellness center, massage therapist, sports therapist, chiropractor, doctor, school teacher, fitness center, personal trainer, yoga studio, all kinds of sport club, Parkinson’s clinic, senior center and community center in Canada should know about the Smovey. On the inside of our palm and on the back of our hand are reflex zones for almost all the organs of our body. Smovey stimulates all those reflex zones through the vibrations created when we swing the Smovey. The precise construction of the Smovey rings are able to produce an approximate frequency of 60Hz, which is the same frequency that occurs naturally in our bodies cells as a new born. Because of stress, environment changes and radiation from modern technology our body constantly struggles with imbalanced frequencies. The frequency of our body’s cells can be regulated by the use of the Smovey. The vibrations are very gentle and can have an amazing healing effect. Our brain is divided in two halves. The right half controls feelings and emotions. The left half handles critical and analytical thinking, speech and communication. Smovey exercises can activate and coordinate both halves of our brain through bilateral movements. We are looking forward to Swing, Move and Smile with you! Gernot and I after the workout.